BOB ABERNETHY, anchor: In New Orleans, recovery from Hurricane Katrina remains slow. The mayor estimates about 100,000 people have returned, of the 485,000 who lived there before the storm, in August. Forty percent of the homes are still without electricity and — again according to the mayor — half the small businesses, 57,000, may have been lost for good. But amid the complaints and the finger pointing, there was this week a celebration. Christ Church, the Episcopal Cathedral of New Orleans, is 200 years old, and it honored its birthday and the city with a formal concert and the street music of a jazz funeral — mourning what was lost but confident of rebirth. Kim Lawton was there. KIM LAWTON: Like any proper funeral, it started with mourning. 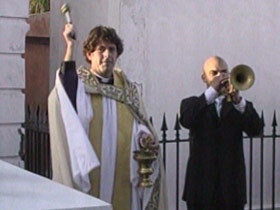 LAWTON: In the city’s oldest cemetery, Christ Church Cathedral’s dean, David duPlantier, performed his church’s rituals for death. With prayers, holy water, and incense, he remembered those who died during Katrina and he mourned the passing of the old New Orleans. Award-winning jazz trumpeter Irvin Mayfield, a New Orleans native, then took up the dirge. IRVIN MAYFIELD (Award-winning Jazz Trumpeter): When we play those slow dirges, they’re serious and they’re slow. They’re like those good old spirituals, and everybody gets to mourn a person’s passing and it’s a sad moment. 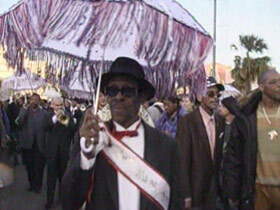 LAWTON: In a New Orleans jazz funeral, after the service, mourners process into the streets in a slow and somber march. Then, the mood begins to change. Mr. MAYFIELD: Maybe a block away from the graveyard, they speed the song up just a little bit. People are kind of joining in, and that’s why you notice a lot of people have handkerchiefs and umbrellas. LAWTON: Those who join in are called “the second line.” The procession becomes a joyous — sometimes even raucous — celebration of the life that has departed and the new life to come. Mr. MAYFIELD: You see somebody do that second line dance stuff, you say, “Mmmmmmm, that’s something!” And that’s what I want to give the people. We have to be serious about our celebration. Just like we have to be serious about our mourning. LAWTON: Christ Church Cathedral has a 200-year history here. And, after Katrina, church leaders said they wanted to demonstrate to their city the fundamental Christian belief that death and destruction never have the last word. Rev. DUPLANTIER: First of all, acknowledging the grief and pain that is real and will continue to be real, but then move it always toward the vision of the promise of resurrection that comes in Jesus Christ. It can do nothing but help the city itself grieve and celebrate. LAWTON: Church officials evacuated New Orleans with Katrina’s onset, and it was more than a week before duPlantier and his bishop, Charles Jenkins, were allowed to return and inspect the aftermath. Hundreds of other churches had suffered major damage — but they found the historic Episcopal cathedral largely intact. The Episcopal diocese immediately began providing emergency aid to hurricane victims, and strategizing about long-term relief. 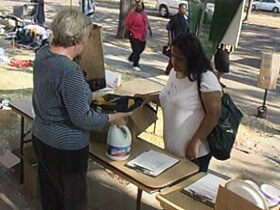 They are still passing out supplies for the massive clean-up efforts that continue. The needs here remain great. Garbage and debris still line the streets. Homes are uninhabitable, businesses shut down indefinitely. DuPlantier says the church is deeply concerned about the city’s recovery. 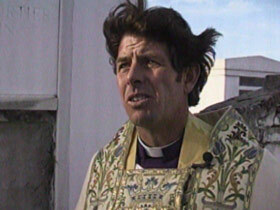 And he says that concern includes the city’s spiritual recovery. Rev. DUPLANTIER: We wanted the church to be involved not only in the tangible aspects of human need, but in what we think of as the soul — the theological, the poetic, the musical, the spiritual, all those things are part of the gifts of the spirit. If that is not connected directly with God’s purposes for his church, I don’t know what is. LAWTON: As a gift to the city, the cathedral commissioned Mayfield to write a jazz composition that told the story of Katrina. And Mayfield says its movements were shaped by the emotions of the jazz funeral — moving from mourning into hope and joy. For Mayfield, the meanings are especially poignant. His father refused to evacuate New Orleans and is still missing. Mr. MAYFIELD: I think there’s no greater healing power than music. And I think that’s just, that’s — it’s not only something that’s going to help me heal, I think it’s something that helps everybody heal. LAWTON: The New Orleans Jazz Orchestra debuted “All the Saints” during a free concert at Christ Church Cathedral. They called the concert the cultural reopening of New Orleans and a symbolic launch of the city’s rebirth. LAWTON: I’m Kim Lawton in New Orleans.